New York Jets fans cheer during the second half of a game against the New England Patriots on Dec. 21 in East Rutherford, New Jersey. Who goes to the meaningless NFL games at the end of the season and why? There’s one obvious reason people attend these games: The tickets are cheaper. StubHub, the online secondary ticket market, sent me data on the average ticket price for each divisional game this year as of Dec. 16, as well as the average home game ticket price for each team this year. Of 96 total divisional games, there were 14 games where the home team was eliminated from playoff contention. Of those divisional matches with eliminated hosts, four had higher than average prices. 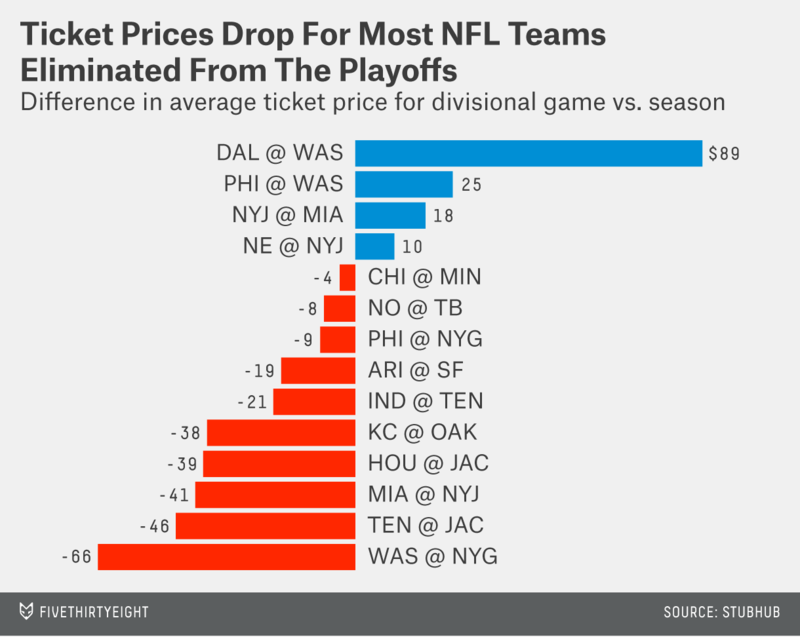 The other 10 games saw lower than average prices, with an average $29 discount for a ticket compared to the rest of the season. But there are motivations other than price. To uncover them, I went to see the Jets host the Patriots in Week 16 — a game that was nominally more expensive than New York’s season average — with recurring Bar Fights muse and lifelong Jets fan Kevin Havas. We met Mark Fugger, a season ticket holder of six years who has been a fan since the Joe Namath days. Fugger explained what the end of the season looks like at MetLife Stadium. He said that while a lot of the Jets faithful were there, many casual fans take Sundays off for things like Christmas shopping. As a result? He wasn’t wrong. I spoke to people around the parking lot and asked them what brought them to the day’s game. The place was full of Jets fans who said they had come strictly to party. I spoke to a group of French-Canadians — two Patriots fans, a Jets fan and a Steelers fan — who had come down for the spectacle and because they don’t have the NFL in Canada. Patriots fans — many of them local professionals who moved to New York for work — said seeing their team play at MetLife was much cheaper than seeing it play at Gillette Stadium. Tom McGarr, another season ticket holder, said many nearby teams in the AFC have fan bases that travel, and that some Jets home games are played in front of fans mostly of the visiting team, particularly when the Pittsburgh Steelers and Denver Broncos are in town. You can see this in the data. 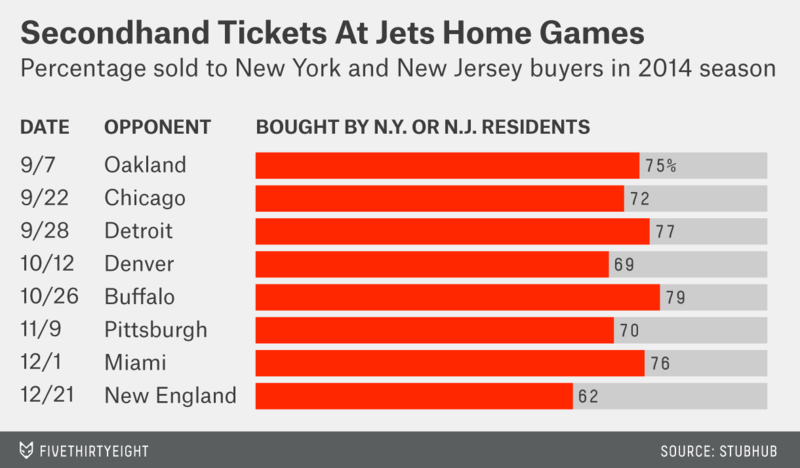 I asked StubHub for location data for who bought tickets for each of the Jets’ home games this season. Here we see the percentage of tickets sold to buyers in New York and New Jersey, the home turf of Gang Green. It’s not a perfect stand-in — there are most definitely many Broncos and Steelers fans who live in the region — but we see dips for the games hosting Denver, Pittsburgh and New England, just as McGarr said. You can also see an increase in the New York/New Jersey share during the fifth home game, when the Jets hosted western New York’s Buffalo Bills. But still, the vast majority of the tickets get sold locally. So who comes to the games that don’t matter? Clearly the diehards, like Fugger. But also a large contingent of hometown fans on more of a budget, or younger fans who want to go to MetLife for the festivities. Or in the case of the Dec. 21 Patriots game, a massive contingent of fans with Massachusetts plates and a full tank of gas.